There is some discussion on the best encoder settings to deliver video with USB thumbdrive. Here's what we use and our recommendations. When deliver video to USB thumbdrive, we export the video to a more universal H.264 MP4 format. This MP4 format is an open standard and is wildly supported by modern computers, mobile phones, tablets and most smart TVs. 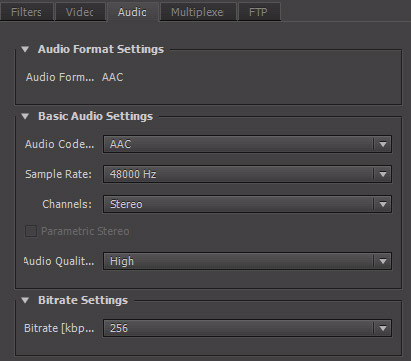 This is our recommendation on the settings using Adobe Media Encoder. The same settings shall be applied to other encoders or compressors. We export the video in 1080p format. Frame Rate : Should match the source frame rate. Final file size is determined by bit rate. The higher the bit rate the better the quality, thus bigger the file size. However, too high bit rate might cause playback problem (stuttering/buffering) as many USB devices cannot sustain a high data transfer rate. 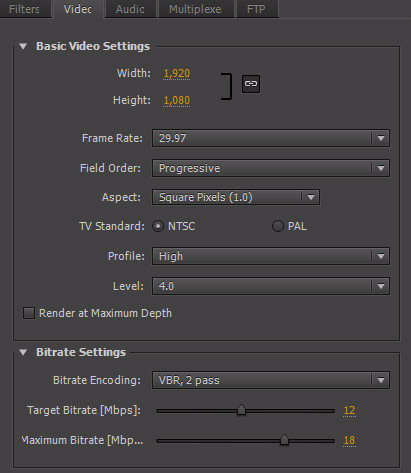 VBR (Variable Bit Rate) is useful in allowing complex scene (i.e. ocean waves, tree leaves) to be allocated more data bandwidth, without causing too much visual artifacts. CBR (Constant Bit Rate) is also a good choice. VBR helps optimizing data stream when video is streaming online. But for local USB thumbdrive playback, CBR can serve the purpose too. In many situations, VBR 1-pass is enough. Some people cannot tell the quality difference between 1 and 2-pass. If you have a long video to encode and VBR 2-Pass is taking too long, try CBR 12MMbps or VBR 1-Pass 12/15MBPS. Similarly, the higher the bit rate the better the sound quality. This is just our recommendation. Feel free to leave your question or feedback below. Posted by Noah stoner on 10/16/2014 4:56:00 PM What settings are you using if doing raw delivery, for bit rate? Do u keep the same bit rate? ffmpeg should have no problem demultiplexing (demuxing for short) those MOV files back into their .h264 and .ac3 components. Granted the workflow is not as nice as using Adobe Media Encoder. However, the above tools are free and if you can get past the learning curve they will become your "video swiss army knife." Replied by LA Color Pros Thanks for your comment. We deliver video in thumbdrive to our clients so they can view the footage with computer, mobile devices, or smart TV. Using 12/15 jobs is to ensure smooth playback. If we will be archiving for our own, we will definitely use higher bitrate. Posted by Kevin Hill on 10/16/2014 7:41:00 PM Great post. Question, what would you be delivering in this case? Client finished product, review files. Replied by LA Color Pros We use this method to encode the final wedding films deliver to the brides and brooms. Posted by Greg Aluise on 10/16/2014 7:46:00 PM I forgot to mention in my previous post that remultiplexing video from one "conainter" format (Quicktime MOV) to another "container" format (MPEG4) does not re-encode the video / reduce the video quality. If video is orange juice and audio is grape juice. Think of "container" formats (i.e. Quicktime/MPEG4) as different brands of storage containers. Maybe Quicktime is a Tupperware container where MPEG4 is a Rubbermaid. They both do the same thing: deliver the H.264/AVC Encoded Video and AC3/Dobly Digital Audio. Replied by LA Color Pros We use this method to deliver the final wedding films to out clients. The videos are editing and export to h.264 .mp4 format. Thus there is no need to demultiplexing the video. Your method is for distributing raw .mov files from DSLR camera to another format. It is an excellent method. Thank you for your suggestion. Posted by Greg Aluise on 10/16/2014 7:51:00 PM In my posts I was mostly referring to a way someone could deliver RAW files (i.e. not re-encoded) in the same "friendlier" MP4 container when their camera only gives them .MOV files... Just trying to give the concept of how the .MOV file is just a container and the data inside is still h.264 video + AC3 or AAC audio. Posted by Kevin Hill on 10/16/2014 7:55:00 PM I had noticed more USB3 thumb drives on the market which can hold the higher bit rate. They cost more but very fast. Replied by LA Color Pros Since we are delivering thumbdrive to clients, we have no control of what kind of device their USB port is. We just have to stick with the lowest common denominator which is USB 2.0 these days. Hopefully in a few years newer devices can handle faster bit rate. Posted by Bob Accettullo on 10/16/2014 8:02:00 PM Great post Taky. I use about the same bit rate settings shown here with a higher audio bit rate of 320. I will also use the same settings and file for my Vimeo uploads as well. Vimeo always re-encodes your mp4 anyway so don't go overboard on bit rate. Replied by LA Color Pros Thanks Bob. Vimeo by default converts file to 720p. I have read someone suggest encode a 1080p version in high 30 CBR to upload to vimeo. Since vimeo will convert to mobile, 720p/1080p yet preserving the original uploaded file, vimeo becomes an online video cloud storage. settings when it comes to video encoding. Replied by LA Color Pros Noah, thanks for your comment. Overall file size is determined by the bit rate settings. Say like a 12mbps 720p file will be the same size as a 12mbps 1080p. I would completely object the idea of a long sequence. It's because many times people got distracted and stopped watching the long clip. The next time, they will have to fast forward the long clip to pick up from where they left off last time. It's easy for a mouse clip. But if someone is watching on smart TV, it will take a long time for them to scroll forward to find the spot. Posted by Upender Reddy on 10/18/2014 9:49:00 AM Thanq u great post u r showing NTSC Pic. Posted by Gabriel on 3/24/2015 12:17:00 AM No FCPX coverage? Posted by David Lawrence on 5/26/2015 5:32:00 AM I'm a mac user only and purchased your wifi thumb drive hoping to use for a client. How do I download content on to thumb drive via mac system. Replied by LA Color Pros Hi, Plug the wireless thumbdrive to your Mac USB port. then you can copy content to it like any regular USB drive. Posted by Valerie on 6/17/2015 12:43:00 PM Using the settings you recommended (output is for client not raw), what size thumb drive is needed for a file approximately 8gb. I am planning to export straight to the drive. Replied by LA Color Pros Valerie, it's best not to export straight to the drive. Export to your local harddrive first. Then copy them files to thumbdrive. Most people deliver their thumbdrive in FAT32 format. It has the most compatibility to Smart TV, game console, etc. However, it will limit to 4GB max per file. You can format your thumbdrive to exFat format. That will not have the 4GB per file limit. However, the thumbdrive will only be playback on computers. Posted by Mike on 9/16/2016 9:22:00 AM Hi, what type of USB read and write speeds do you recommend to buy? 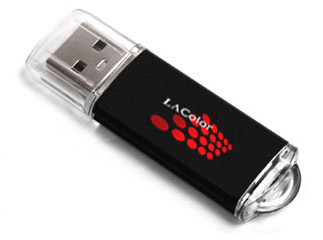 Replied by LA Color Pros Popular USB drives are USB 2.0 and USB 3.0. If there isn't a big price difference, go with USB 3.0. Otherwise, USB 2.0 is fast enough for most HD video playback. Posted by Daniel on 10/4/2016 7:07:00 PM This is an awesome thread, thank you! I am also looking at transitioning to Flash drive deliverables for my weddings as opposed to DVD, for the most part due to going from CS6 to CC and Adobe not continuing with Encore in their CC apps. So when you export you are creating mini sub-files as opposed to one complete 60 minute wedding clip? Posted by Anton on 10/17/2016 6:24:00 AM how lucky im find this thread where this is my actually problem right know. last week i did some short movie for couple, i finish it and they are happy. then they asked me to deliver it for shown in 32" Sony LED TV via USB for ceremony day. i copying the master file to USB and test it out and yeah the COLOR look so bad compare to PC and i hate it and they will. so, what should i do to match the color? Replied by LA Color Pros Not every TV USB port can playback video files. So you are already lucky that it plays the file at all. But if the color is off only on that TV, that will be the issue with that TV only. Posted by Sofieno on 5/24/2017 7:14:00 AM Hello Dear !!!! I have a big problem with 16 gb pen drive i copy on it the mp4 video files with 1:30 hour lenght and after many times the dead pixel appears when play it.